SPARK represents you, your children and our teachers, teams, and community united to maintain the academic excellence for all Normal Park Students. The main tenet of the NPMM Education is to educate the Whole Child. To accomplish this for all of our students, SPARK must raise $300/student. These funds provide the additional educational & experiential components of the curriculum that make our school so unique. 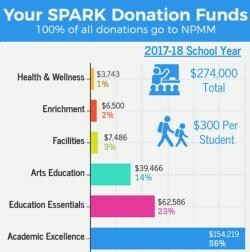 If you are interested in supporting Normal Park SPARK..
Online donations can be made through the “Donate Now” link on the sidebar at the top of this page. You can also choose to make a recurring donation that is budget friendly (e.g. $5, $10 or $100 per month). All donations are tax deductible to the extent the law allows. The Normal Park Museum Education Fund is a 501(c)(3) non-profit organization; Following a donation, you will receive a letter from The Normal Park Museum Magnet Education Fund to serve as receipt for any and all amounts donated. If you are eligible for a matching gift from your employer, please enclose the appropriate form with your check. For any questions, please contact Normal Park SPARK, at 423-498-6880 or normalparkfund@gmail.com.